Why You Should Choose This Caterham Timber Cabin for Your Family. The stylish shape of this ‘Caterham’ log cabin creates a stunning look from the ‘norm’. With its delightful large veranda front, it truly is a special building. With its wide double doors and opening window, either contemporary or Georgian style if that suits you, it’s a great looking as well as practical building. An ideal summer house for you to enjoy your garden, or maybe a place for your hobby or to just enjoy your garden. If you give a little thought you will be able to imagine many uses for this lovely building. Its looks will never disappoint. Nordic timber is well known by the Swedish as a great material and is used throughout their country and is used on these cabins. Besides the slow-growing rate of the timber the wood is naturally denser and therefore possesses great strength as well as being more stable. This ‘Caterham’ cabin is enhanced using this wonderful ‘green’ material. It has 44mm thick interlocking logs which extend out 100mm of the corners as well as extra thick floor and roof its strength is unbeatable. There are no nasty, cheap materials used on these cabins as the grade of timber used is top notch. The strong well made doors and windows on these wooden cabins have features not normally available anywhere else. They are enhanced with part laminated material which reinforces and stops any possible twisting or warping effect. Hinges (which adjust up -down – left – right) make them a joy to hang and to live with. All items designed around the great British weather. With the double glazed windows as standard, this will help to make it a joy to be in. All timber naturally from renewable sources and is properly kiln dried. Compare that with some log cabin firms which even use chipboard or OSB boards in their buildings which are totally unsuitable. And all to try to save a few pounds. These delightful ‘Caterham’ cabins can optionally be assembled for you, saving you time and effort. These installers do this on a regular basis so your new building will be up and ready to use very quickly and importantly correctly. Some people may like to assemble these buildings themselves and as everything is done to make it straightforward is possible. However, these buildings can be a little harder than a normal cabin to build. The cabin’s design has been assembled at the factory before being flat-packed and shipped to you. All parts are bar coded for ease of access and by following the guideline can be assembled efficiently. The secret is to take your time and work through each step one at a time. The web can be great for locating log cabins for sale but it can never show you the quality of the product being displayed. This is why it’s important to consider viewing before purchasing, if possible. Even if you don’t view it’s worth dealing with an established dealer who is confident enough in their product to has a buildings display site. This alone proves that they are happy for their log cabins to be scrutinised at close quarter – unlike many UK companies selling on the internet. If you can visit you can decide for yourself about the quality of the building so that you know when your new building arrives you won’t feel disappointed. With 1st Choice, a family business, started in 1979 BT (before Thatcher) you can also be sure that they understand the requirement to make log cabins to a standard and not DOWN to a price. Our Ethos is to ensure quality reigns over cheapness and to date has been the right policy. Just OVER 2.5m Tall. Great 2.05m Wall Height. 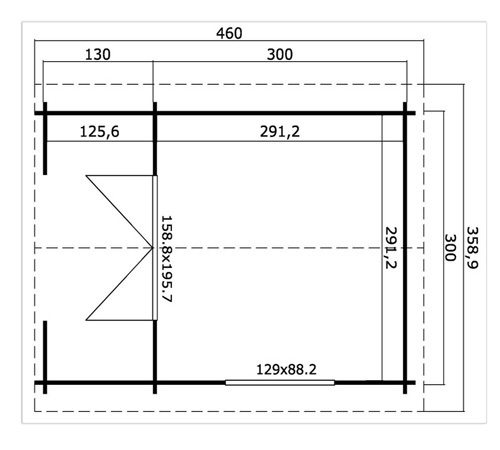 Size: 3.0m x 4.3m (10ft x 14¼ft nominal). Caterham Apex or Gable Style. Note this is the external size of the body of the cabin. The lugs extend 100mm on each corner making the overall size (as most other companies quote) 200m larger. We mention this so you know you are comparing ‘eggs with eggs’. Approximate clear internal size will be approx 2.9m x 4.2m. Please check with us if internal size is crucial. Doors: Joinery quality double glazed double doors 159mm wide x 1957mm high (62½in x 77in) – approx sizes. Include free are Georgian bars for a Georgian effect. These can be left out if you choose. Easy adjust hinges complete with gasket seals, fitted silver finish door handles, cylinder lock and two unique keys. Low doors sills giving you easier access into your log cabin. Supplied untreated. Beware of doors with single glazing or excessively high door sills. Windows: Double joinery quality outward opening window included as standard. Included free are Georgian bars for a Georgian effect. These can be left out if you choose. Size of double windows is 129mm x 88mm (50½in x 34½in). Complete with easy adjust hinges, silicon gasket seals and delightful silver finish window handles. Supplied untreated as standard. Double glazed as standard NOT single glazed. Georgian window option. Lower Walls: Height: 205cm (80in) – all Caterham buildings. Ridge Height: Height. 256mm (101in) – on all Caterham cabin kits. 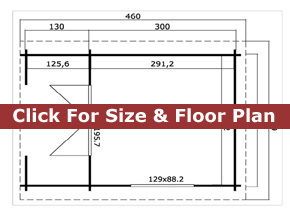 Importantly Just OVER 2.5m meaning these log cabins may be subject to any planning restrictions you may have. Our Trentan ‘Caterham’ wooden cabins for sale feature superb light and airiness, ensuring that using this log cabin with your family and in your garden will enhance your life style. These are immensely versatile buildings and will suit all manner of uses which you can share with your family and friends. Superbly designed to fit into most gardens effortlessly – this is what good design should do. With many different qualities of log cabins available it’s always wise to view before buying to ensure you are not buying ‘cheap’ and getting ‘cheap’. Visit our display site near Guildford and Farnham and judge for yourself how good these Trentan cabins are. You will be very welcome.